For many snowbirds, the drive south in the winter and north in the spring is all part of the fun and offers an opportunity to explore along the way. There’s nothing more boring than long hours in the car on the Interstate along with thousands of trucks and cars. Not to mention, it can be very hard on a body that has reached a certain age. ‘Nuff said! 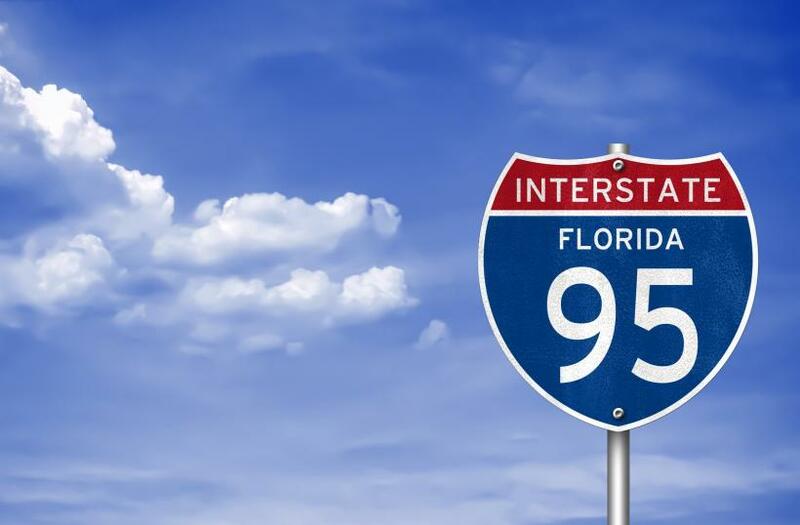 If you are driving between Florida and Eastern Canada, chances are you will take one of three primary routes: I-75, I-95 or I-77 & I-79. For those who might like to take the odd break from the long drive home, or who want to turn the drive down or home into a road trip, we’ve compiled a list of places where you might consider spending a night or two, or just stopping for a short visit. Where you go will depend on your route, of course, but all of these destinations are not too far off the major snowbird driving routes. Historic St. Augustine is the oldest city in the United States, founded in 1565 by the Spanish. The city is known for its Spanish colonial architecture, many historical sites and great beaches. Nearby Anastasia State Park is a protected wildlife sanctuary. Visitors can also explore the Castillo de San Marcos, a 17th-century Spanish stone fortress with views of the St. Augustine Inlet. Golf fans will love the World Golf Hall of Fame. Located near St. Augustine, The Hall of Fame Museum has a permanent exhibition as well as ongoing temporary exhibitions related to golf. The main exhibit covers the history of golf, various techniques, famous players and organizations. It also covers golf course design, clothing and historic equipment. Visitors can try their hand at a couple of shots for a small fee and golfers can try their hand at the two Hall of Fame golf courses. If you choose to spend the night, you can stay on the property or at one of the many hotels in the general area. Tallahassee is the Florida State capital and has many interesting historic sites and museums. It is also the home of Florida State University and the Governor’s Mansion. At one time under the control of Spain, the city has several examples of Spanish architecture including the Mission San Luis, which dates back to 1656 when Spain established a capital for its settlements in Florida. The mission served as a religious, military and educational facility for the Apalachee, converting them to Christianity. Savannah is one of the most quintessential Southern cities in the U.S. and is a mecca for visitors, offering great walkability, cobblestoned streets and picturesque Southern architecture in the charming Historic District. There are many tours you can take by foot, trolley or bus and the guides are very knowledgeable. Add to this great Southern food and lots of good music and you’ve found the perfect spot to stop along the way! Located on the Atlantic coast just outside Savannah and accessible by bridge, Tybee Island has lovely beaches, lots of beach cottages and homes and a relaxed, seaside atmosphere. Its 18th century lighthouse and historic Fort Screven are a reminder of the area’s historic importance. One of the top 10 largest cities in the U.S., Atlanta is a great place to visit, as there’s a lot to see and do here. The Georgia Aquariumis the world's largest indoor aquarium and there are many historical museums, including the Martin Luther King, Jr. National Historic Site, which incorporates Dr. King’s childhood home. You’ll also find the World of Coca-Cola, featuring the history of the famous soft drink, the College Football Hall of Fame, and the Carter Center and Presidential Library, home to former U.S. President Jimmy Carter’s papers. Atlanta is also home to CNN Headquarters where you can take a studio tour. Not far off the I-75 near Tennessee border there’s you’ll find the impressive 40,000-square-foot Gateway Antique Mall where you can explore for hours. Beautiful Hilton Head Island is reachable off I-95 and is part of the Lowcountry region of South Carolina. Hilton Head has beautiful beaches and world-famous golf courses. Museums of interest include the renowned Harbour Town Lighthouse and Museum and the Coastal Discovery Museum. The Pinckney Island National Wildlife Refuge salt marsh offers a wide array of wildlife for outdoor enthusiasts. There are also lots of hotels and condos around the island for those who want to spend the night. Charleston is one of the loveliest cities in the U.S. and well worth a visit. Founded in 1670, Charleston was an important port city. Today visitors come to see the Historic District with its cobblestone streets, horse-drawn carriages and antebellum houses. Another favourite with visitors is Battery promenade and Waterfront Park, which overlook the harbour. Across the harbour is Fort Sumter, where the Civil War began. You’ll also find boutiques and shops, a great restaurant scene featuring Southern cuisine and music venues. The Myrtle Beach area stretches from Little River to Pawleys Island, comprising 14 distinct cities along the South Carolina coast. The area has 60 miles of sandy beaches, a vast assortment of entertainment and family attractions, great restaurants, outstanding fishing and world-class golf. Myrtle Beach area hotels, merchants and attractions are offering discounts for Canadians this spring through May 2018. Discounts range from 25% to 55% off when you show your Canadian passport to help offset the Canadian dollar exchange rate. You can find more details here. Dobson is accessible off I-77 at exit 93, and is located at the northern end of the Yadkin Valley wine region. Dobson has four wineries including Shelton Vineyards, North Carolina’s largest family-owned estate winery. Here you’ll find the Harvest Grill Restaurant, walking trails, picnic tables and a hotel. You will go right through Charlotte on I-77 and the city is well worth a stop or an overnight. You can take a walking tour of Uptown Charlotte (a great way to stretch your legs after hours in the car) to explore the local history, parks and museums, including the NASCAR Hall of Fame. Charlotte’s Epicentre is lively at night with dining, entertainment and events. Or, you can opt for an evening in NoDa (North Davidson Street, just north of Uptown), home to breweries, restaurants, art and entertainment. A little West of Charlotte and worth the extra miles, you’ll find Asheville in the beautiful Blue Ridge Mountains. The town has historic architecture and several arts districts with galleries and museums to explore. It is also home to the amazing 19th-century Biltmore estate, a massive structure housing a priceless art collection. Enjoy a spa treatment at the Ballantyne Hotel & Lodge or 18 holes at the Golf Club at Ballantyne. You’ll find great options for wining, dining and shopping, including the new Charlotte Premium Outlets across I-77. Off I-95 at Smithfield exit 95, you’ll find the Carolina Premium Outlets, with more than 80 designer and name-brand outlet stores such as Banana Republic, Brooks Brothers, Coach, Eddie Bauer, Polo Ralph Lauren, Talbots, Timberland and Tommy Hilfiger. Lodging and restaurants are located nearby. You can also check out the Ava Gardner Museum while you’re in the area. A great place to break your journey - attractions here include high-level military museums such as the Airborne & Special Operations Museum and the 82nd Airborne Division Museum. Fayetteville is also home to one of the region’s amazing canopy tours - ZipQuest Waterfall & Treetop Adventure - and be sure to take in the lovely Cape Fear Botanical Garden. The city has an assortment of hotels and motels for overnight visitors. This theme park named after famous entertainer Dolly Parton is located near Knoxville, Tennessee at Pigeon Forge in the Great Smoky Mountains. Dollywood is the biggest paid tourist attraction in Tennessee, featuring amusement park rides as well as traditional crafts and music of the Smoky Mountains area. The park hosts a number of concerts and musical events each year and is the site of the Southern Gospel Museum and Hall of Fame. Whether or not you’re a fan of country music, a trip to Nashville at least once in your lifetime is a must. This is truly the music capital of North America. Yes, you can attend live performances at the Grand Ole Opry, but you can also drop into any bar and listen to great music for the price of a beer. Nashville is home to the Country Music Hall of Fame and Museum and features several arts centers and museums along with hundreds of music clubs and bars downtown. Chattanooga is the home of the International Towing and Recovery Hall of Fame and Museum. Train buffs will enjoy the Tennessee Valley Railroad Museum, featuring the largest operating historic railroad in the South. One of Chattanooga’s great attractions is the Tennessee Aquarium, caverns, and waterfront attractions along the Tennessee River. Downtown, there’s the Chattanooga Choo Choo Hotel, located in the renovated Terminal Station. The Tennessee Riverwalk is a 13-mile trail. Rock City on nearby Lookout Mountain, Georgia is also the site of Ruby Falls and Craven’s House. The Lookout Mountain Incline Railway is a funicular railway that takes visitors from the St. Elmo Historic District to the top of the mountain. The Kentucky Derby is held in Louisville on the first Saturday in May at the famous Churchill Downs racetrack, preceded by a two week Kentucky Derby Festival in the town. Lexington is a major center for thoroughbred horse breeding and is home to two racetracks, Keeneland and The Red Mile harness track. Historic Keeneland has races from April to October and is steeped in tradition. The Red Mile is the oldest horse racing track in the city and the second-oldest in the nation. The Kentucky Horse Park opened in 1978 and has become a major tourist attraction and museum, but it is also a working horse farm. The Rolex Kentucky Three Day Event is held here each spring just before the Kentucky Derby. Corvette fans and car lovers will want to take a few hours to explore the Corvette Museum in Bowling Green, Kentucky, featuring over 80 Corvettes on display including historic models and prototypes. Virginia is about mid-way between Florida and Ontario which makes it a perfect stop for Canadian snowbirds. The state is home to an energetic mix of history, culture, dining, shopping and over 280+ award winning wineries. The Northern region of Virginia off I-95 includes Alexandria, Arlington, Fairfax County, Loudon County, Prince William County & Manassas – each one well worth a visit. You can find more information here. This quaint small town is the the apple capital of the U.S.A. and a good place to get in a game of golf. Located at the intersection of north-south Interstate Highways 77 and 81, the town has long been a crossroads for Canadian travellers heading south or north to or from Florida. History buffs visit this historic town to discover sites, stories and personalities that changed the nation during the American Civil War. You really need a few days to explore Washington, DC but if you’ve never been there, it is well worth a visit. If you are travelling on I-95 you will go right through Washington. Located on the Potomac River between Maryland and Virginia, the city has many fine monuments and buildings including the Capitol, the White House and the Supreme Court. There are too many museums to mention and you might also catch a hockey or basketball game while you’re in town - if you’re lucky.